Seven months old and growing fast! Meet our little fur-ball, Snowy. He is eight months old, a Siamese seal/lynx point cross, and although he thinks he’s Mufasa the Lion King, he sneaks a suckle on his mommy’s nightgown every opportunity he gets. He’s my hubby's and my baby and we love him and he has us all (including 'Granny' and 'Grandpa') wrapped around his little paw. Like any only child, he loves to be the centre of attention and often honours us with his amazing aerial silk shows on the curtains while we’re having dinner! He is a real 'drama-queen' and fiercely complains and protests relentlessly if his litter-box is not cleaned to his specifications. He also becomes very cheeky when he feels that he’s been unfairly reprimanded. Then there are his multiple personalities. He sleeps like a human, eats like a little pig, plays catch like a dog and attacks his toys like a crocodile. He has an obsession with cleanliness (like most cats) and often tries to clean the humans as well! He has a fascination with water and has to drink from every tap he passes. It has to be running water - because any decent cat would drink water from a bowl only in extreme circumstances! He loves his Wheatbix cereal (dry) in the morning. The humans have cereal, so he wants to have it too. His biggest challenge everyday is to play 'get the humans out of bed in the morning'. Being light-coloured he gets dirty easily, especially playing in the empty fire-place. So he regularly gets to bath, which he really doesn’t mind. In fact, we think he enjoys being in the warm water (just don’t tell anyone). But like most cats, he doesn’t like being wet – we need to follow a very specific routine to get him dry – rub him with a towel, blow-dry, put him on a blanket in the sun in the window, kiss him a lot, brush him a lot, and feed him lots of kitty-treats. He loves to chew on the herb-garden, especially the mint, parsley and celery (oddly, he does not like catnip). He has a weakness for mint and eucalyptus and would dig my lip-balm or chewing gum out of my handbag if I do not keep it zipped. He is a very curious cat and wants to help us with everything we do, or at the very least, watch us doing it. I believe that God created him to be the special blessing he is in our lives! Ronel, your description of Snowy's antics made me laugh out loud! Our Siamese cats have such very definite preferences, don't they? And how clever of him to try and switch the light on in the mornings. My cat also goes through the same 'please wake up and feed me' routine as Snowy's, but mine has never yet (thank goodness) worked out how to switch the light on! 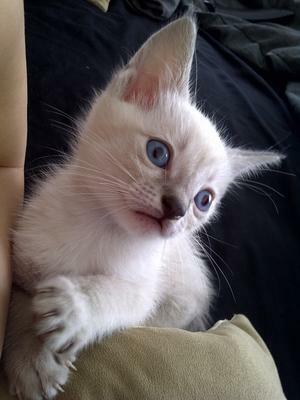 He sounds and looks like a real little character, as all Siamese cats are, and I hope you enjoy many happy years with him. We have a blue point that I adopted November 19 and it was the best decision I have made in a while. He is such a joy to me and my gentleman friend and so entertaining. We just LOVE him to bits! We have named him SQUEAKY! What a beautiful kitty! What a character Snowy is. 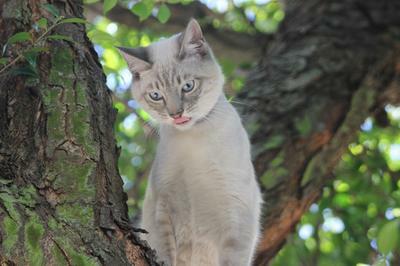 I think it's a Siamese thing that they actually get an attitude with you when they get caught doing something bad, lol. My meezers do this meow yowl thing at me when I catch them doing something bad, it's the funniest thing. Snowy has definitely landed in the lap of love and luxury. If reincarnation was real, I would have liked to come back as Ronel's cat. He is purrrrfectly described and the apple of his mom's and dad's eye - more spoilt and loved you could not get!! !